Uremic frost as the name indicates is the frosting of urea. In this condition, the urea level increases in the blood stream that it start excreting through sweat. 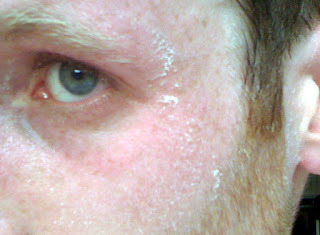 The sweat containing urea when evaporates and dry on the surface of skin like urea deposits in known as uremic frost. The urea start excreting through sweat when the urea nitrogen level in blood rises above 200. Uremic frost can be commonly seen in the pre-dialysis period. This condition is not common now a days, it can be seen in the under developed countries and in patients who show no compatibility with dialysis. The presence of uremic frost shows the severe condition of azotemia. The uremic frost can be diagnosed clinically but can also be checked by testing the crystals in a saline solution. Uremic frost occurs when the kidney is suffering from last stage of disease and it is considered an indication for the dialysis. The urea on the skin appear as white crystals on skin surface. The patient may feel many problems like nausea and anorexia. The high level of blood urea nitrogen may also lead to other diseases like gout in which the urea converting to uric acid start accumulating in joints. Uremic frost is a condition which can be seen with naked eye because it appears as white crystals on skin surface and it is the main symptom appearing. Uremic frost is considered a symptom itself because it appears as an indication of last stage renal disease. It is also a symptom that the patient require dialysis. The patient may feel nausea and hunger i.e. anorexia and pain in joints. Oliguria and alteration in sensorium also occur. The patient feel itching on skin due to the urea deposits. Pericardial rub, uremic fetor may also occur. The malfunctioning, damage and failure of kidney are the main causes behind uremic frost. As the damaged or failed kidney may not function properly and is not able to filter urea in urine. So ultimately, the blood urea nitrogen level start rising. When the value of blood urea nitrogen reaches above 200, the urea finds its way of excretion via sweat. Whenever sweating occurs, the urea crystals comes out with it and evaporated sweat leaves urea behind as white powdery crystals. But it has very low rate of occurrence due to renal impaired therapies in developed countries. Uremic frost is an indication of kidney failure so the underlying cause should be treated to treat uremic frost. The dialysis is a treatment option in patients with uremic frost. But the patients who are not compatible with dialysis have to go through renal transplantation for the sake of survival. The renal transplantation may be HD. Uremic frost occurrence shows the severity of renal failure. Medications are of no use in treating the last stage kidney disease because it will take time and the condition will be more severe with the time. So only a surgical treatment is recommended.